I don't know how much longer it is going to take to get approval at RPGNow for Pocket Creatures Volume 1. Until its approved, it won't show up for sale. With the weekend knocking on our door quickly followed by Gary Con I'd like to get this in the hands of gamers sooner than later. So, I'm releasing it to The Tavern's Facebook Group in a few minutes. Pocket Creatures Volume 2 is laid out and ready to be submitted. 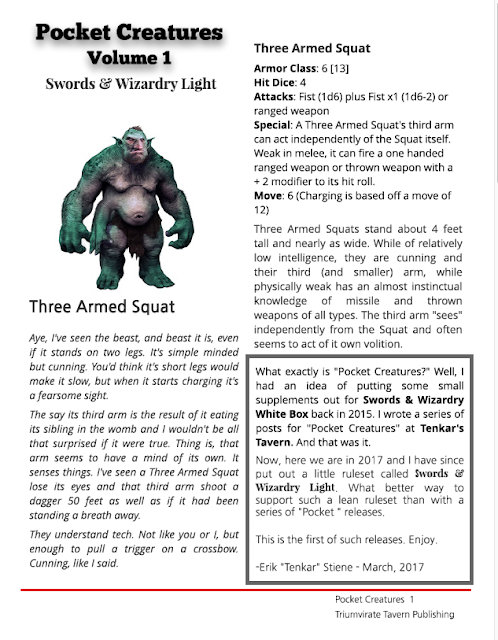 I'm not sure we'll have a print ready copy of the Swords & Wizardry Continual Light rules in time for Gary Con. If that's the case I'll bring a few dozen print copies of the two Pocket Creatures Volumes to hand out.